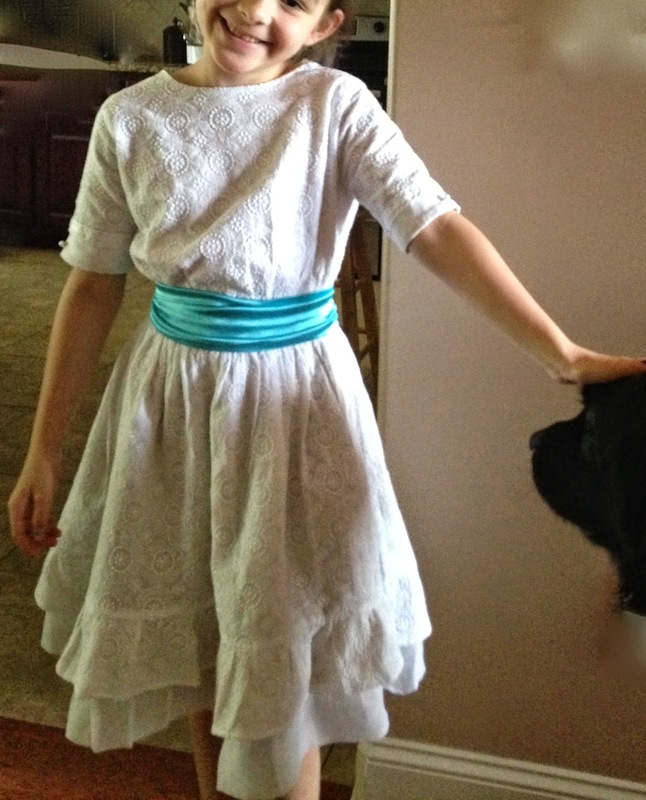 FINALLY finished Miri's spring dress. It's made from a knit fabric that I let her pick out herself. The pattern was the same one that I used for her Alice costume for Halloween. It has all these different options you can use, and I let her pick which ones she wanted. She chose the bib front with shoulder straps and that little placket-type thing in the front (I used some leftover blue lawn from Lina's Louisa dress). She picked out the buttons to decorate it and the venice lace as well. This was so easy to cut out and put together that I really truly believed I'd have it done in a day or two. Wrong. I now know that venice lace, while being my favorite kind of lace, is not suitable to being gathered. I did it anyways, around the placket, because it looks better that way. Then, because it looked a little lonely there all by itself, I added lace around the top of the bib. And then the straps. It looked even better. And finally, to top it all off, I added the last of it around the waistline. I sewed it all on by hand, since some parts of the lace were hard to get the needle through and I didn't want to damage my machine. Not to mention I wanted to make it as precise as possible. That waistline was the worst though. It took much careful, painstaking accuracy to get each stitch through the lace and the front of the bib but under the lining so that it wouldn't show up on the inside (it HAS to look nice and neat and professional on the inside as well or it will bother me forever). Fits good. But, being that it's 48 degrees outside, it's just no match for her favorite "shells" bathing suit (shells are the top part - like the seashells Ariel wears).